Enjoy homemade pizza, subs, fresh salads and pasta from Ozark Mountain Pizza. The food served here will tickle your tastebuds. Located next to the Stonebridge Welcome Center on Hwy 76 in Branson West. Phone: 417-386-4210. Owner Jamie invites you to dine in, carryout or have her great menu items delivered (delivery most everywhere in Branson) This locally-owned restaurant offers fresh hand-tossed pizza. Customers rave about their gluten-free pizza. It’s all in the fresh ingredients, she says. Fast delivery. Click here to check out their menu. 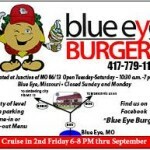 If you’re hungry for a delicious burger, make it a point to stop in at Blue Eye Burgers 1 mile north of Blue Eye, MO, when you’re out riding the Table Rock Lake/Three Bridges Loop. Want to know more about them? Click here to view the Blue Eye Burgers menu. 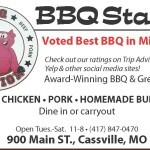 You will find good eats and ice cold adult beverages at The Throttle Down Tavern when you’re cruising the MO Hwy 13 the Table Rock Lake/Three Bridges Loop. Better yet, you can put your kickstand down and stay with Chip and Evie at their motorcycle-themed Cruise Inn in Kimberling City. 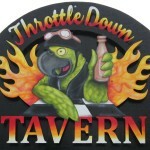 Click this link to read more about The Throttle Down Tavern.